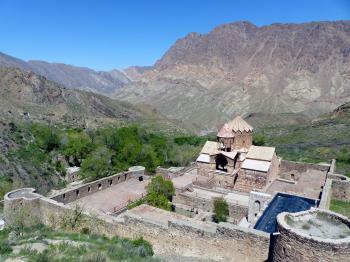 The Armenian Monastic Ensembles in Iran cover three Armenian Christian religious buildings. Based on Armenian church architecture, they also show influences from the Byzantine and Persian world. They bear testimony to the spread of Armenian culture in this part of the world. The site consists of the Saint Thaddeus monastery, the Monastery of St Stepanos and the Dzordzor chapel. They originate from between the 7th and 14th centuries, but have been rebuilt many times due to nature and human inflicted disasters. The chapel even was moved from its original location in the 1980’s due to the construction of a dam. The monastery of St. Thaddeus is the second religious centre for the Armenian church, after the cathedral of Echmiatsin. It is the supposed place of the tomb of St. Thaddeus, one of the twelve Apostles. This makes it into an important place of yearly pilgrimage. The Armenian monastic ensembles comprise two monasteries and a church belonging to the Armenian Apostolic Church of Iran. This was probably the WHS I was most looking forward to in preparation of my recent tour of Azerbaijan & Northern Iran. Since it has been added to the List, I’ve always wondered why a Shiite theocracy would nominate a purely Christian pilgrimage site. Also, remote monasteries belong to my favourite types of WHS. Out of the inscribed locations I only visited the St. Thaddeus monastery, which is considered the main site. Legend has it that the apostle St. Thaddeus brought Christianity to Armenia, and this spot (now located on Iranian soil) was the place where he died. Sometime between the 7th and 10th century, the St. Thaddeus Monastery was founded here. It developed into a place of pilgrimage for Armenians from Iran and neighbouring countries. Annually in summer a big festival is held in the vicinity of the monastery, with thousands of pilgrims staying in tents. From 1930 to 1947, the monastery was the seat of the Catholicos (spiritual leader) of the Armenian church. As befits any good monastery, it lies in a very remote spot. The day before my visit I overhead our Iranian guide and Dutch tour leader in fierce debate about how far the drive from Tabriz is and whether it is worthwhile to make a day trip. Neither of them had ever been there, or possessed reliable information about the distance and road conditions. Is it a 240 km drive one way or return for example? At 7 o'clock next morning we left with 75% of the tour group towards the east, to the extreme northwest tip of Iran. 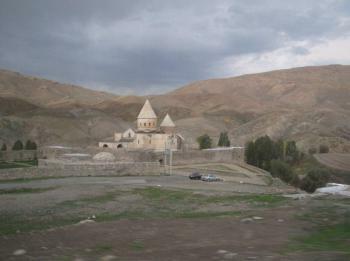 St. Thaddeus Monastery is located near the border with Azerbaijan and (obviously) Armenia. Landscape-wise this is the best part of Iran I’d seen so far, with views on numerous snowy peaks. The monastery itself lies in a barren area. You can see its two white, typical Armenian conical towers from afar. It’s not a completely uninhabited area though: next door lies a poor Kurdish village. From a distance, the church seems to be intact and in good shape. Up and close though you can see that a lot of props are needed to keep it upright. Cracks in the walls caused by various earthquakes are clearly visible. The church interior feels sober because of the gray / black walls made out of tuff, just as the churches in the motherland Armenia (hence the nickname 'Black Church'). Texts in Armenian script and simple crosses are carved into the stone. The exterior is much more decorated. Most of these decorations date from the 19th century, when an additional (white) part was added to the church due to more and more pilgrims arriving. At different heights sculpted reliefs were added, representing the 12 Apostles, local kings and less recognizable individuals from the Iranian folklore. You really need to take your time circumnavigating the church to take it all in. I even went back for a second time when I found a series of images in the UNESCO nomination file which I had not spotted on site. Afterwards, I heard no complaints from my 12 fellow travellers (not afflicted with the WH virus) about the 2x 4 hour-drive ‘only’ to see a small church. It’s a fascinating work of architecture and important piece of regional (religious) history. The final question to be answered remains: why has the Islamic Republic of Iran chosen this Christian site to represent the country? The fact is that the Iranian government does have a selective tolerance for certain religious groups or ethnicities (they don’t seem to mind the Kurds or Zoroastrians either). The Armenians, beloved by few in the wider region, somehow are Iran’s favourites. According to Wiki: “The Armenians remain the most powerful religious minority in Iran. They are appointed five seats in the Iranian Parliament (the most within the Religious minority branch) and are the only minority with official Observing Status in the Guardian and Expediency Discernment Councils.” In all major cities of Iran one can find active Armenian Apostolic congregations. On my last day in Teheran I attended a mass in a prominent church, where some 60 churchgoers showed up. The existence of this kind of pluriformity in Iran is one of the main lessons I learned from this trip. Unfortunately, this ‘tolerance’ does not extend to other groups such as the Bahá'í (who are actively persecuted) or to allowing conversion from Islam to Christianity. As Els has recently reviewed the St Thaddeus Church part of this WHS, I will concentrate on its second “ensemble” (the word used by UNESCO) - around St Stepanos Monastery. This lies around 15kms west of the town of Jolfa, which is itself c230kms (a 2.5 hour drive by car) north of Tabriz on the Iran-Azerbaijan frontier opposite its Azerbaijani counterpart of Julfa which is situated within the exclave of the Nakchivan Autonomous Republic. In order to place St Stepanos in its geographic and historical context, it is perhaps worth dwelling a little on the history of nearby Julfa/Jolfa in relation to Armenia. Julfa developed in the late middle ages into a prosperous, entirely Armenian, town and was captured from the Ottomans in 1603 by Shah Abbas. He decided he couldn’t hold it and decided forcibly to evacuate its inhabitants to use their skills in helping to build/populate Isfahan! Today there is a prosperous suburb of Isfahan called “New Jolfa" which contains the highly ornamented (and recommended) Vank cathedral built by those resettled Armenians from 1606. The remains of Old Julfa became an archaeological site which included a cemetery containing many fine Khachkars. (Armenian carved tomb stones) – none of which now remain. Azerbaijan says that there never were any and Armenia that Azerbaijan destroyed them all between 1998 -2006! “Facts” would seem to support Armenia in this particular aspect of the Armenian-Azeri spat. The road from Jolfa to St Stepanos and on to St Thaddeus runs alongside the Iran-Azerbaijan frontier and passes the location of Old Jolfa. The route has a significant military presence. This, together with the occasional military check, requires that any cameras are kept out of sight - which also prevented any photography of the Darrasham Chapel element which is situated after St Stepanos but to the right of the road almost on the river bank and very close to the frontier –it almost seemed to be a part of the military check post! (In fact the core areas of both St Stepanos AND of Darrasham Chapel actually reach to the Araxes river and should be added to the “On National Border” Connection). In Soviet times this was the USSR border and a now “useless” railway line runs along the Azeri side of the Araxes river canyon. Iran has improving relations with Azerbaijan, but generally over the years has been more supportive of Armenia in the post Soviet conflict between those 2 countries. St Stepanos is nicely situated in this canyon (photo). On the way from Jolfa you will pass another of the locations of this ensemble in the form of the Chapel of Chupan but we were already “running late” on this very full day so we made straight for St Stepanos! The entry fee was (only) 150k rials and a short walk up a wooded path from the car park took us to the fortified church. Although legend has it that a church was first founded there in 62 AD (!!!) by St Bartholomew (he of the original 12 Apostles) it probably originally dated to the 7th/8th Centuries, whilst the current one dates primarily from 14th C and has undergone many destructions, abandonments and renovations depending on the changing state of Persian/Turkish relations and the attitude of the ruling dynasties in each towards Armeinans and Christianity. The Araxes border between Russia and Persia was only fixed in 1828. Around this point in time the Qajars had reason to support the rebuilding of the church. “Before” and “after” photos on site showed that the church/monastery needed yet more renovation in order to prepare it for Nomination in 2008. Indeed, in common with so many WHS in Iran, the scaffolding was still present in Apr 2016! So, after 90 minutes at St Stepanos, we set off on minor roads along the 135 kms to St Thaddeus. The Araxes canyon gave way to open country and a large lake created by a dam shared between Iran and Azerbaijan whilst, in the distance, snow capped Mt Ararat, across in Turkey, dominated the scene. At the time we still had hope that we would also be able to see the third ensemble within the inscription - St. Mary's Chapel, Dzordzor. This, according to the AB, “is in the Makuchay river valley, downstream from St. Thaddeus”. From the guardian at St Thaddeus however it emerged that there is no direct road connection between the 2 and that, to see Dzordzor, we would have to partially backtrack and reach it from the north via a dirt road from Maku – a further 45kms. We gave up! Our experience of St Thaddeus was very much as reported by Els. Despite our exteremely full day we felt it justified 1.5 hours before we set off back to Tabriz – arriving back at 20.30; 11.5 hours and c 600kms since departure!! 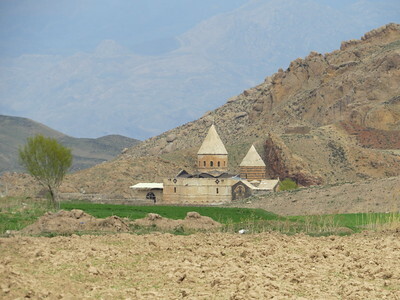 It is a serial nomination, but consists only of two elements, the St Stephanos monastery near Jolfa, and the "Black Church" (or, officially St Thaddeus monastery) near Maku. It is possible to do both on one day, but it will be a long and exhausting journey. Though theoretically one can get an Iranian tourist visa without having a local agency to fix his travel arrangements, it is advisable to have one, specially if you want to visit off the beaten track destinations - like these monasteries - as public transport will not take you there. Prior arrangements are helpful financially also, as - due to the sanctions still in function - no credit cards work in Iran, and bank transfers are also quite difficult. We made the arrangements through an Iranian friend, who hired a vintage Mercedes bus for us - the best option available in Tabriz. As our maximum speed on highways was cca 40 km/h, long journeys looked even longer. St Stephanos is much easier to reach - but far less interesting than the Black Church. It is close to Jolfa, a bustling border town, that connects the Islamic Republic both with Armenia and with Azerbaijan. Jolfa is an easy two-three hours trip from Tabriz, the capital of the province, and the place most probably you will spend the night. From Jolfa the road winds near river Arax, the border with Armenia. The natural setting of the monatery is really stunning - on a lush green slope, looking down on the river valley. The car park is cca 2-300 m from the monastery. While climbing up to the gate we noticed that even though it meant to be a Christian pilgrimage place, the grounds surrounding the monastery were packed with seemingly Muslim families having picnick lunches in the green - the favorite pastime of Iranians deprived from most of the amenities of the West. Though the monastic ensemble was founded in the 9th century, what we can see now is a much later structure. It was heavily reconstructed in the Safavid times and again in the 19th century. The monastery as a whole is quite nice and interesting - full with tourists from the other side of the border, but the main church is rather diasppointing with its fully reconstructed interior and less than mediocre icons. The monastery is visible from a distance because of the massiveness of the church, strongly characterized by the polygonal drums and conical roofs of its two domes. There are several chapels nearby: three on the hills east of the stream, one approximately 3km south of the monastery on the road to Bastam, and another that serves as the church for the village of Ghara-Kilise.Legend has it that a church dedicated to him was first built on the present site in AD 68. Not much appears to remain of the original church, which was extensively rebuilt in 1329 after an earthquake damaged the structure in 1319. Nevertheless, some of the parts surrounding the altar date from the 10th century. Much of the present structure dates from the 19th century when a Qajar prince gave money to raconstuct the then ruinous structure. The Turkish border (Bozorgan) is quite close - less than one hour - from there. Bozorgan is a big busy border station, open 24 hours, so the best option, if you want to see both monasteries in one day, either to spend the night in Turkey, cross the border early in the morning see the Black Church and then further your way to Jolfa and then Tabriz, or the opposite way as we did it. Both monasteries ask for an entrance fee -100 and 150 000 rial respectively. The 8 sites are located within 3 clusters around St. Thaddeus Monastery, St. Stepanos Monastery and Dzordzor Chapel. They can be reached by private transport from the provincial capital Tabriz. St. Thaddeus and St. Stepanos are some 100km apart, while the Dzordzor chapel lies away from the main road near St. Thaddeus. It will take a very full day to cover them all in one day trip. Moved from location of original construction: "The Chapel of Dzordzor is in fact the remains of a much larger monastic ensemble, which disappeared at the start of the 17th century. Its vestiges were moved and reerected because of the construction of a dam. The dismantling of the ruins of the chapel and its reconstruction were carried out in 1987-1988"